Hawaii punter Tim Grasso, left, played through some pain in his knee last year, but this year he's been able to boot the ball pain-free. He worked out with kicker Dan Kelly, right, yesterday. There are two sides to Hawaii's week off for kicker Dan Kelly. "I wish it wasn't a bye week because I want to get out there and kick again," said Kelly, who is working through a bit of a slump to start the season. "At the same time a bye week is good to get the rest and figure out the mechanics and figure out all the kinks because we're going into the WAC." Kelly has missed his last three field-goal attempts over the Warriors' last two games and head coach Greg McMackin said the coaches would look to give the senior some competition in practice this week. Kelly is 1-for-4 after going 12-for-17 last year, with the misses ranging from 41 to 48 yards. He's 6-for-6 on extra-point attempts. "I try not to overanalyze it," Kelly said. "It's a very natural thing that I'm trying to do and it hasn't been feeling natural. I just have to kick enough to have it feel natural again." Most of Kelly's work over the past two days has been on kickoffs as the Warriors continue to concentrate on refining their special teams play, working on placekicks on the adjacent practice field later on. "He's been kicking the ball well and he just has to take it from practice to the game," McMackin said. "I believe in Dan. He won two big ballgames for us last year and I've got complete confidence he'll be the guy I know he is." The Warriors wrap up their first bye week of the season today and will devote the second half of this morning's practice to the annual scout bowl, a scrimmage giving the Warriors' younger players and reserves a rare chance to play full speed. "We'll be looking at some guys for the future and just see them compete," McMackin said. There were those days when Tim Grasso dreaded practice. With a tear in his hamstring limiting his flexibility, just a few kicks in the morning would often leave his leg throbbing for the rest of the day. After enduring often excruciating treatments in the spring, Hawaii's senior punter is kicking pain-free again. "I had to just scrap to get by (last year)," Grasso said, "and this year I can do what I can do." Grasso's average of 42.4 yards per punt ranks him 28th in the country and he's landed four of his 16 kicks inside the opponent's 20-yard line. But the Warriors have faced two of the nation's premier returners and breakdowns in coverage left the Warriors 109th in net punting after three games. But UH coach Greg McMackin said the Warriors' issues in the punting game haven't been with the kicks themselves. "He's been punting outstanding," McMackin said. "We couldn't ask any more of him. He's been putting it where he's supposed to." A group of Warriors escorted center John Estes off the playing field after a shoving match during yesterday's practice. Although he's been able to increase his average, Grasso has sacrificed a bit of distance to control the direction of the kicks, angling them between the numbers and the sideline. Grasso spends much of the Warriors' practices with long snapper Jake Ingram, who's noticed the difference in his demeanor this fall. "You can definitely see he's more confident, especially during the games," Ingram said. "He's not second-guessing or questioning himself, he's just going out and punting. I guess that comes with being healthy." Grasso has been quite a bit busier in his second season with the Warriors. With the offense working through some growing pains, Grasso has been called on an average of 5.3 times in the first three games this season, compared to 2.7 last season. "Punting is kind of a contradictory spot," Grasso said. "I really don't care if I punt or not. If I do, I'm going to take advantage of it because that's my position on this team. But I'd rather go the whole game without punting and see us blow somebody out." It's been a roller coaster month for Aaron Kia. 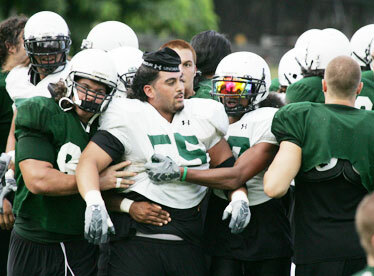 The junior ran first at left tackle for much of fall camp only to see Laupepa Letuli win the starting job. He moved back into the first unit this week due to a knee injury to Keith AhSoon that's projected to keep the senior out for six weeks. Now he's again looking to prove he can do the job. "It's more like a third or fourth chance," Kia said. "This is another opportunity and I need to stop talking and actually do it." Kia has been working through sore knees, but "I have to man up and execute," he said. With Adam Leonard resting some aches during the bye week, sophomore linebacker Po'okela Ahmad has made the most of his increased repetitions with the second unit over the last two days. He had an interception on Tuesday and added another yesterday in 7-on-7 drills. He also closed quickly on a play to hold Kealoha Pilares short of a first down during the team period. "I'm working hard and just trying to get into the rotation," the Kapolei graduate said. "I'm listening to the coaches, watching film, just trying to better myself every day. Right now it's a bye week so I've got an opportunity to work."